Few artists can claim to have revolutionised their medium as Merce Cunningham did. A legendary dancer and choreographer, Cunningham stands amongst the giants of modernism for focusing on dance as an act of pure movement, rather than a vehicle for narrative or representation. He also developed the concept, along with his lifelong companion John Cage, of separating dance from music. Cunningham was born in 1919 in the small city of Centralia in Washington State. His brothers followed in the footsteps of their lawyer father, but Merce was drawn to performance at a very young age. He studied tap dancing as an adolescent and between 1937–39 he was enrolled at the Cornish School in Seattle, where he met two of the most significant people to enter his life – dancer Martha Graham and avant-garde composer John Cage. 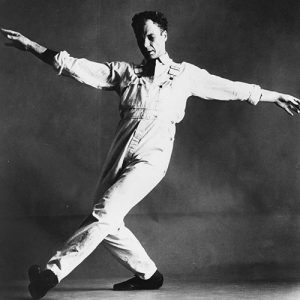 Graham, a pioneering modern dancer in her own right, noticed Cunningham’s extraordinary talent and cast him as a soloist in her company in New York for six years. John Cage arrived in New York in 1942 and Cunningham appeared in the composer’s first percussion orchestra recital at the Museum of Modern Art. Cage encouraged Cunningham to strike out on his own as a choreographer and through their efforts the idea of making dance and music autonomous from one another emerged. In the summer of 1953, with Cage, Cunningham formed his full company during a residency at Black Mountain College in North Carolina. Black Mountain was also where Cunningham befriended the artists Robert Rauschenberg and Jasper Johns, who would later serve as the company’s resident designer and artistic advisor respectively. Cunningham worked with a wide range of prominent artists and designers including Rei Kawakubo, Roy Lichtenstein, Bruce Nauman, Isamu Noguchi, Frank Stella, and Andy Warhol. The décor and music for his performances were always created independently and were only brought together for dress rehearsal. This extremely trusting creative process opened the door for the unexpected to happen and, it was felt, reflected more accurately the random quality of life. Indeed, Cunningham drew much of his inspiration from observing the everyday movements of people and animals. He also fostered unpredictability by employing chance procedures, such as the roll of a dice or the use of the I-Ching, to determine the order of steps and the placement of dancers on stage. Cunningham choreographed almost two hundred works over the course of his lengthy career. He was the principal dancer in most of his productions until arthritis took its toll, and he continued to create new works right up until the year of his death. He was also innovative until the last. His passion for experimentation made him a leader in the use of new technologies in the arts, be it film, video, or digital motion capture animations. From 1991 he began sequencing dances with the Lifeforms computer program, which led to a new choreographic complexity. Cunningham’s impact on young dancers continues to be felt today through the regular restaging of his extensive repertoire and through professional training offered by the Merce Cunningham Trust.